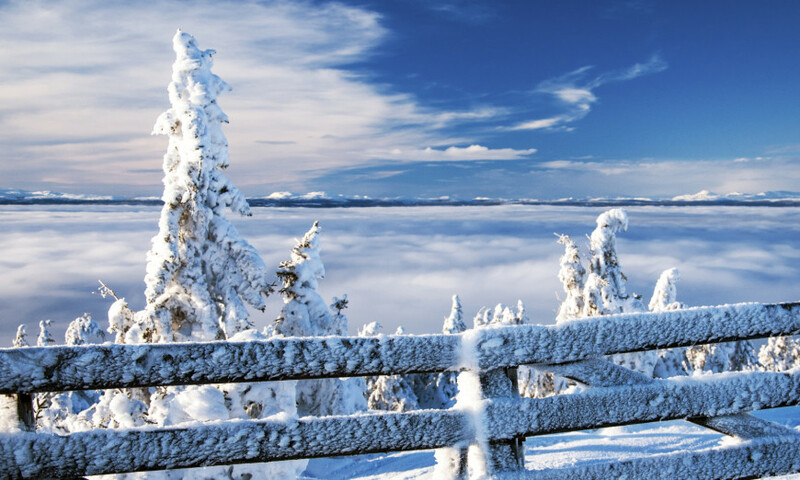 Personal Preparation – It’s important to be properly prepared for winter photography. Dress appropriately for the temperature, and always wear warm boots. Gloves seem awkward to a photographer, but frozen fingers will cut your day short. Invest in a pair of flip-top gloves, which allow you to expose your fingers when needed and keep them warm the rest of the time. A pair of sunglasses will reduce the reflection off the snow and prevent eye discomfort. 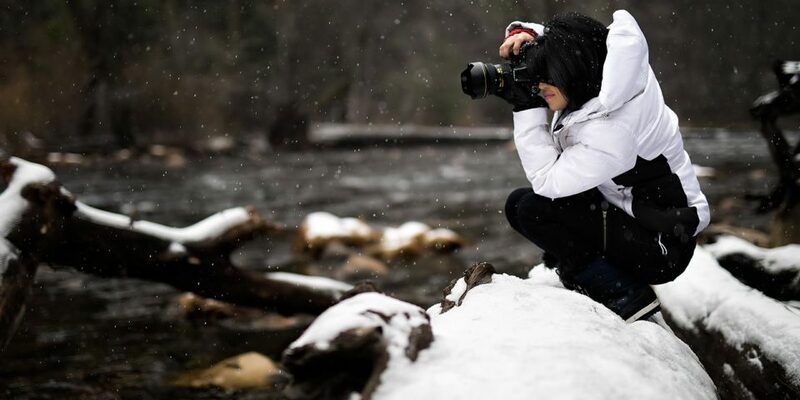 Out in the Cold – Proper care of your camera is critical in winter weather. Do not try and keep it warm when not in use. Occasionally people place their camera inside their jackets so their body heat can keep it warm. If your camera is warm and then exposed to cold air, it can cause condensation that can fog up your lens or cause electronic components to short out. Keep your camera cold to avoid these risks. Batteries, however, drain faster in colder weather, and you should keep them warmer. Bring extra batteries and memory cards. Keep all your equipment accessible, and protected from melting snow or any form of moisture. When the day is over, warm your camera slowly to avoid condensation. Pack everything in the camera bag, close up tight, and let it slowly warm up in your house in the coolest room. Don’t open the bag for a couple of hours. 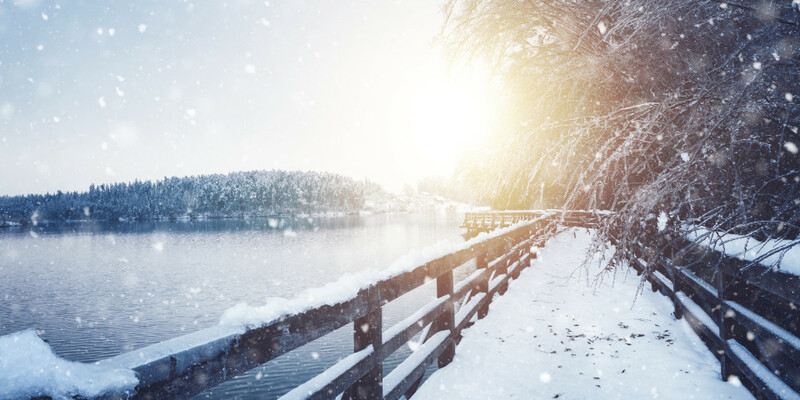 Light Meter – Don’t trust the light meter in your camera when shooting snowy scenes, as so much white confuses the internal metering system. Light subjects reflect differently than dark ones, and a meter measures reflected light and calculates the best exposure for the image. A hand-held light meter provides far better accuracy. Because every light meter aims for medium brightness, you need to overexpose when shooting snow scenes. Polarizing And Neutral Density (ND) Filters – The polarizing filter is great for reducing glare and creating a beautiful effect. It also enriches the colours in your image and deepens the sky. You can also use an ND filter to darken the sky without affecting the subjects in the foreground of your image. Shooting Snow – To prevent snow flakes from becoming big streaks on your image, shoot with a relatively fast shutter speed. Try 1/250th of a second, and increase until you get white sharp specks. Cloudy days are better for shooting than bright days, which can cause harsh shadows and upset the contrast. Increasing your exposure by two f-stops is usually just right. If you don’t want heavy snowflakes to show in your image, you can eliminate them by mounting your camera on a tripod, increasing the aperture, decreasing the ISO, and shooting with a long delayed shutter. There will not be enough time to capture the snow as it falls, and you have eliminated it from your image. Follow these tips and you will fall in love with winter photography in spite of all its challenges.